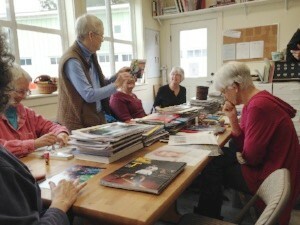 Quimper Village and McCamant & Durrett Architects are joining forces to host the Senior Cohousing Weekend Intensive on June 15-17. 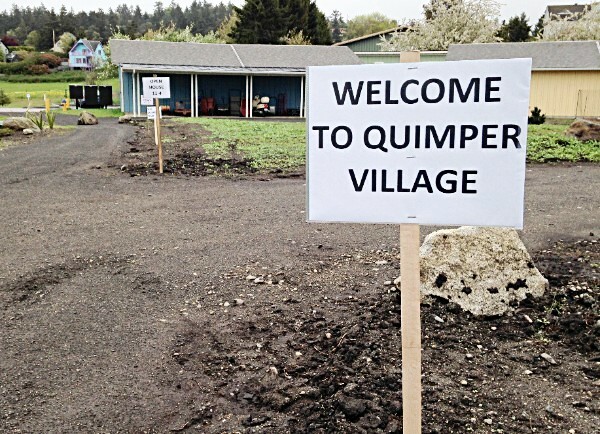 The conference will take place on Bainbridge Island and will include a tour of Quimper Village in Port Townsend. 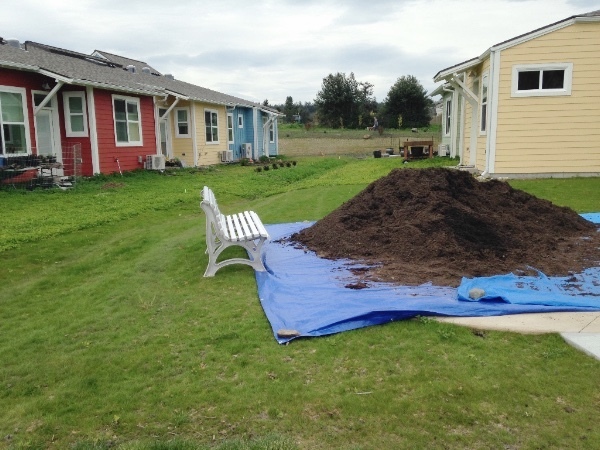 If you are interested in cohousing and are considering starting or joining a project, this weekend will inspire! 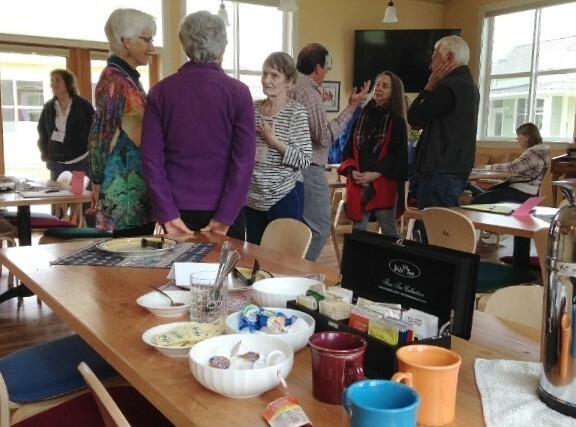 You will meet other co-housers and learn how they did it, learn how you can do it and what it's like to live in cohousing. Amidst exclamations of praise for our kitchen, tubs of fresh picked purple sprout broccoli, and a bundle of knives, Chef Arran Stark bursts into our Common House ready to educate and entertain a rapt audience of QVers. Chef Stark is changing food culture not only at our local hospital, Jefferson Healthcare (JHC), where he is executive chef and food services director, but also in the whole region. He is a local fresh food hero. 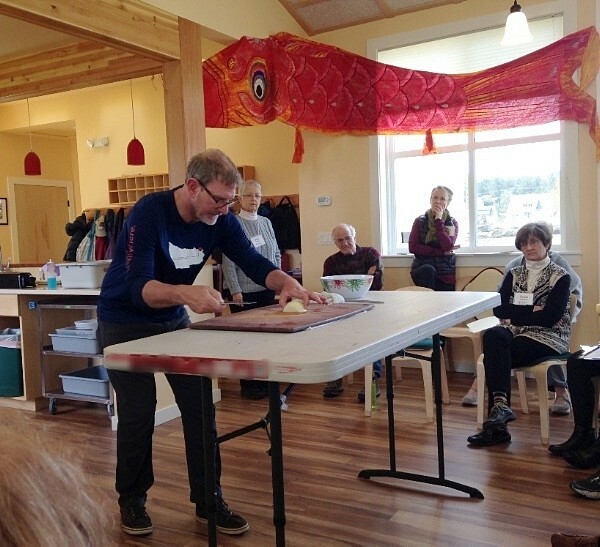 He hosts cooking classes at the Port Townsend Farmers’ Market, community groups and especially in schools. He is all about locally sourced bread, meat, produce, and seafood, with a special place in his heart for brassicas. Preparing meals for both vegans and omnivores is a challenge. At JHC, Arran always prepares vegan starch, vegetable and soup courses. Most recipes can be adapted using olive oil and coconut milk in place of dairy. For a crunchy gluten-free substitute for breadcrumbs, Arran uses cooked quinoa to top casseroles and “breaded” fish. Simply brilliant! The real showstopper, however, was the knives! First, Arran sharpened them (at a 38-degree angle) and then he showed us how to keep our fingertips tucked in and out of the way. Demonstrating his culinary knife talent, Arran diced an onion to perfect 1/4-inch pieces. He cited John Travolta’s disco moves (!) as the perfect model for the cross-body swing (keep your hips loose) necessary for the right push-pull action when slicing and dicing. For further cinematic inspiration, he noted that the kitchen techniques in the animated movie “Ratatouille” are very authentic. There are 3 ways to walk into our Village, so signs helped direct people. Below: Mena welcomes visitors to the art studio. We love pets. 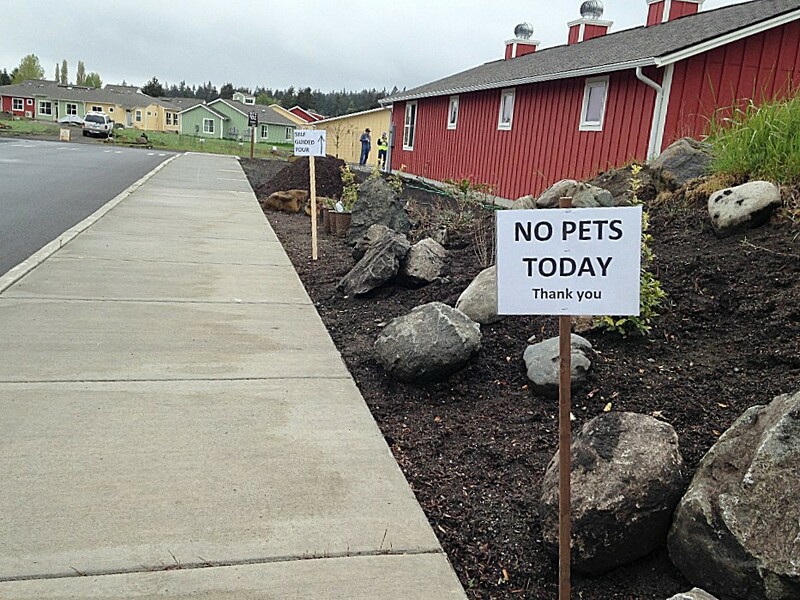 But not at our open house. Below: Three members generously opened their homes for the event. 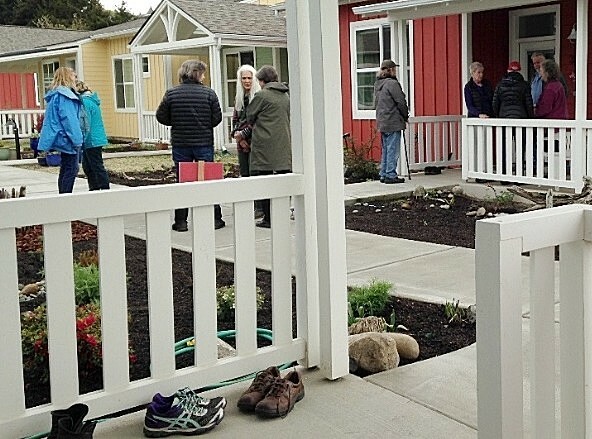 It was hard to get an accurate count, but we estimate between 150-200 people visited us on Sunday at the National CoHousing Open House. Here, two visitors sit in front of the wood shop with John and Phil. We have a few extremely talented wood workers in our community. Holy Crap! Are We Lucky! Later in the day, I intercepted a smiling PamC as she strode down Sage Lane with a handful of her small collages. Hmm. She had gotten in touch with her right brain. It made me think of all the learning opportunities at Quimper Village: Chair Yoga, Bridge, cooking, woodworking, landscaping, painting, CPR and AED classes, and others. And then there is the opportunity to express our personal concerns and complaints at Friday Forum. For many of us, that is a learning experience, too. It’s been about 6 months now since we all moved in to Quimper Village, and the honeymoon is still going on. 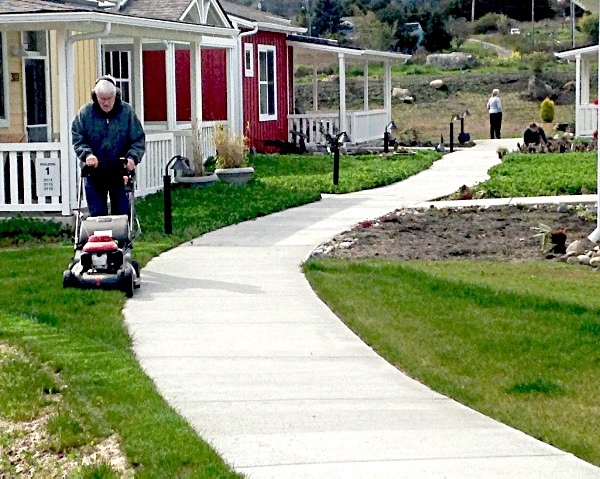 Despite the many hours spent in all the team meetings, chores and meals, the many decisions we all hash over about aspects of living here, most of us are still reveling in the community of co-housing and the kind and thoughtful neighbors who surround us. Almost without exception, most of us had lived in one or more houses over the years where we barely knew our neighbors beyond saying hello in the street, if that. We oft en didn’t know who they were, and they might not know us. Almost without exception, most of us questioned whether we would suffer a loss of privacy by moving into such a close-knit village. Weighing the pros and cons of moving to such a neighborhood, I can now say with certainty, closer is better. Here’s why. Recently, I had an experience of fully understanding the value of living in such a tight-knit community. One recent morning, I found myself in a rather embarrassing and potentially quite dangerous situation. (Please don’t tax your imagination to figure out what it was.) Valuing independence all my life, I hesitated calling on anyone to come to my aid. I soon realized, however, that I had gotten to the point where I felt I’d better seek help at the nearest hospital. What to do? Call 911? I really didn’t want to do that. Then I remembered that I’m now surrounded by loving friends who would not hesitate to come to the aid of any one of us, just as I would for any of them. So I called a near neighbor and said I needed help to get to the hospital. Within minutes, Cheron came to fetch me in one of our handy golf carts, scooted me down to her car, and whisked me off to the ER at Jefferson Hospital. Even though Cheron offered to stay, I didn’t want to disrupt her day any further, so I thanked her, and she went on her way, leaving me in the good care of the ER staff. At Quimper Village, we have each other’s backs. We care about each other. We know if we need anything, all we have to do is ask anyone. Often our needs are met, even before we ask. We really do care about each other. That’s why I’m so jazzed about the whole co-housing concept. Yes, there’s a time and a place for independence in our lives. And then, later in life, there’s huge value in being surrounded by neighbors who really cherish each other. There we were in the goo-pit, all excited -- can’t have co-housing without houses. Action Time! We rolled up our sleeves, put on hard hats and steel-toed boots and sallied forth singing proletarian songs, ready to go out and build beautiful straw houses. That’s when we learned about the wolf: reality. Where can we build? What kind of houses? Where do we find a bank we can rob? How do we get more people to join us? Who does what, when, where, how and to whom? And why? How do we find out things? How do we make decisions? How do we implement those decisions? We didn’t know. We weren’t a hierarchical pile, with Brilliant Executives at the top and peons under the lash. We were (mostly) retired! When you’re retired you usually don’t have anyone to tell you what to do, and if you tell someone else what to do they laugh and go off for a beer. Now what? There’s a thing called “emergent organization” by academics and consultants. When people really want to do something they’ll figure out a way to make it happen: they self-organize, and self-discipline, and self-correct. Along the way they pick up some tools to help them do those things, they learn some tricks, and they sort out the who and how and when and so on. They learn how to work together by working together, keeping in mind that the main thing is to keep the main thing the main thing. Consultants will happily charge you a new Lexus for putting that into organization-ese: decide your goals and then follow the “critical path” to get there. So that’s what we did. Or what we’re trying to do. It’s not always easy, especially as we add new people midway in our mad dash. The absolutely essential thing is that every now and then you stop, take a deep breath, and dive back into the community goo-pit. But that was Chapter I, sort of. (see our April edition for Chapter 1) We’re not past that, by any means, but we grew/are growing so fast that perhaps we’ve not devoted enough time and effort to keep our growing chorus singing the same tune. Quimper Village started out like toddlers do: they manage to stand up, and then do a lot of staggering, falling and bouncing off of things. Eventually they learn (if all goes well) how to dance. We still stagger a bit, and we can waltz or maybe line dance, but a tango… maybe we could use a few more dancing lessons? Our first steps were as a small group, small enough we didn’t need a lot of organization, but we realized we soon would, and took action. Pat rummaged in the idea bin (hard work—some ideas are pretty heavy!) and found one called “dynamic governance,” or “sociocracy.” This explicitly anti-hierarchic concept is built around key principles (the experts say; I’m summarizing here). But if there’s something so “wrong,” so objectionable, so bad for the group, any Member can stop it dead in its track s by saying “no.” You should not refuse consent because of some personal dislike. Equally, you should refuse to accept an action you think violates basic values/visions of the community. Like the Three Musketeers, all upset if one is upset: we all “own” that “no.” We must take an objection seriously, work our mutual problem until we find a way to resolve it and reach consent. If there finally is no possibility of consent, we have to admit failure and vote. Dreadful thought! Hasn’t happened yet. Would really contaminate the goo pit. #2 Organizing by circles, we avoid having bosses and serfs, maintaining our consent system. Teams, not committees, do things because committees are associated with chair critters and hierarchies and boring crap — all bad stuff. All Team members are equal (and thus responsible for keeping themselves from being bored). Teams organize by function. QV has Finance & Legal, Social, Design, Landscape, and others. In their area, they have responsibility to make decisions for all of us. Down here in the goo pit we trust them to make decisions for all of us, and to follow up. This helps us get a lot of work done efficiently - letting people who are deeply into a topic make our decisions. Of course, a Team may decide that X & Y are so crucial, and/or so in need of the greater wisdom of all of us, that the Team should refer it to the entire membership. For example, while still wearing water wings in the goo pit, some brighter members concluded we’d need land on which to build our houses. Well! We swam ashore and agreed to form a Site Team to find land. PamC was very important because of her background experience and dedication, but all members participated vigorously in hunting up possible sites, checking maps, or doing whatever was needed, and eventually selected several sites. 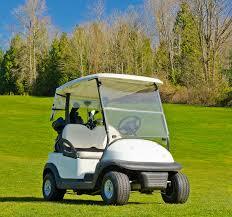 Members all met one fine day and drove around examining the sites and rating them. We then discussed ratings, and agreed on certain ones for further exploration. Eventually Site Team settled on our F Street site. JohnC, acting for the Finance & Legal Team, undertook long, delicate and extremely successful negotiations with the owner. The F&L Team vetted the arrangements, lawyers did their thing, the entire QV Membership consented — and we own it! 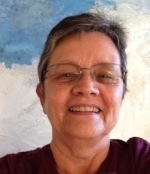 When Pat came up with dynamic governance as a model for our “process,” she was acting as her usual squishy soft self, full of kindness and good intentions, looking for ways to channel conflict, reinforce harmony and paste angel wings on potential devils. Our Process Team is charged with keeping that music playing and occasionally offering more dance lessons. I confess to having an occasional desire to see Attila the Hun whack the table (or a neck) with his sword and Get Things Done! But the feeling passes, and I snorkel on in the goo pit. 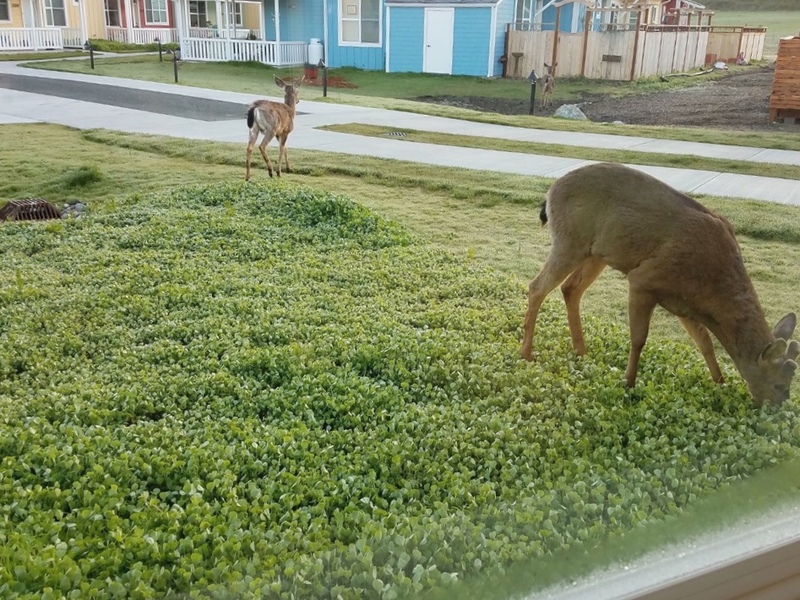 Spring has us outside and working in our yards. 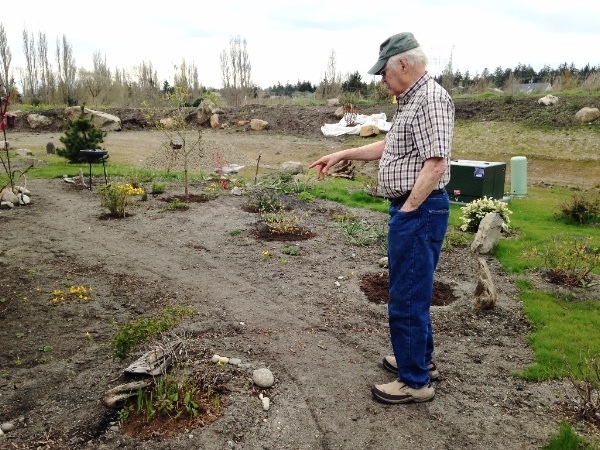 Pam is planting some hellebores in her yard; JimP is mowing the community grass; several loads of topsoil have been delivered for use by members; Ivar explains his plan for a path. On January 21, 1927, the Port Townsend Commercial Club reorganized their group into an official Chamber of Commerce. It is uncertain when the Chamber organized the visitor center, yet it has been helping visitors and assisting locals for at least 38 years. The Visitors Information Center (also known as VIC) has over 50 volunteers donating many hours to answering questions, making ferry reservations, and helping people find businesses, parks, hotels, bike trails and, yes, Victorian homes. Anne and Cheron, two of our QV neighbors, are long time volunteers at the VIC. 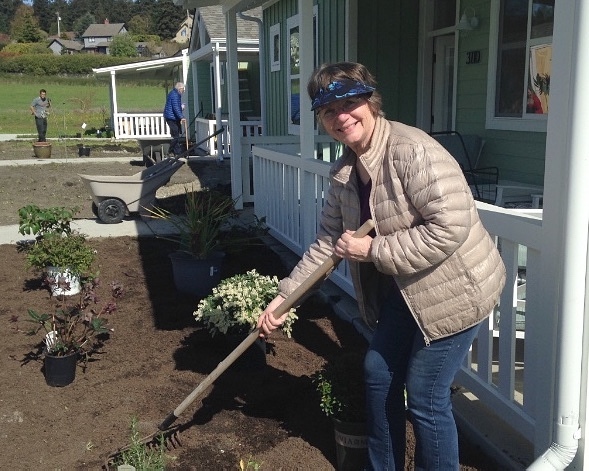 Anne began working at the center nine years ago when she first moved to Port Townsend. A friend told her that it was a great way to find out what was what in town and a place to meet great people. 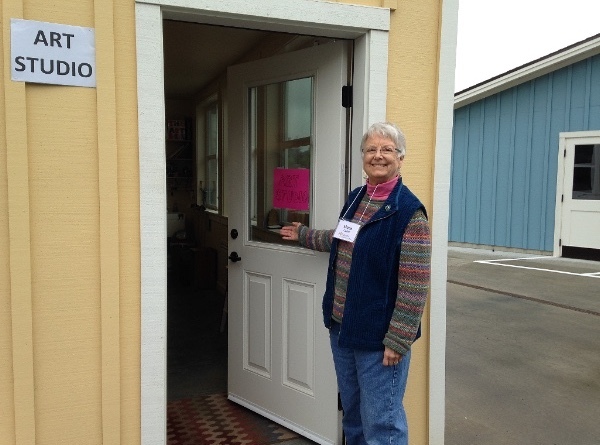 She worked with a veteran volunteer until she felt comfortable finding information for folks coming in. Anne enjoys talking to them. “You get a bit of their history while helping them find what they want.” Working at the center is so very different from other things she is involved with. Anne likes the change of pace and the perspective that she gains while assisting visitors and locals alike. Cheron has also been volunteering at the VIC for eight to ten years with the same shift each week. People that come in are usually upbeat and excited to find out what there is to do or see. Before she starts her shift each week, Cheron, her co-worker, and the two workers going off shift, get together to chat, laugh and talk about what’s going on in their own lives. The volunteer job has deepened relationships with other volunteers, some of whom now do outside things together for fun. 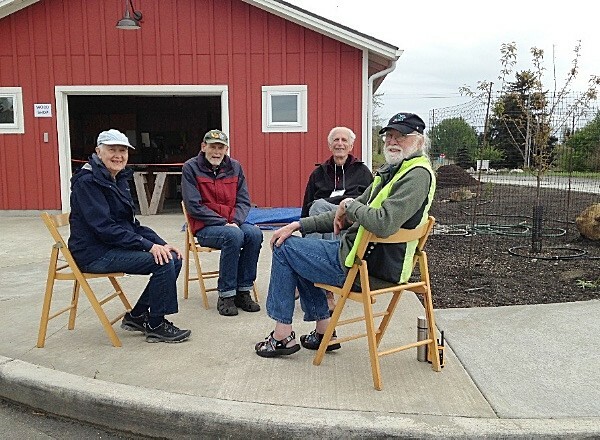 All four of these volunteers often check out other visitor centers when they travel and compare notes when they come back. Cheron is very enthusiastic about her job and loves the interaction with people. She especially likes finding out what people like to do and directing them to places that fit. She often asks what they would suggest to HER if she came to their town. Cheron and Anne, along with the other great volunteers at the center, keep the brochures and maps arranged and available as well as occasionally mailing packages to people who are considering moving here. Both women also enjoy the ‘outings’, also known as ‘FAM’ tours (familiarization tours), to businesses in the area. They find them informative and enjoyable. They agree that it’s a great way to know their town and resources and to meet amazing people. 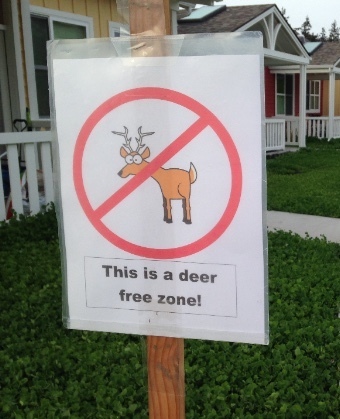 We are learning that the deer can't read.